Believe it or not, not everyone who has IBS needs to follow the low FODMAP diet! The low FODMAP diet has been such a revelation in the treatment of IBS symptoms that one can forget there are actually many things you can do to help self-manage your IBS symptoms before trying the diet. The low FODMAP diet might have the most robust research data for its effectiveness in IBS but other more simple dietary interventions can also work. Indeed a recent randomised controlled trial (OPEN ACCESS) found a diet low in FODMAPs reduces symptoms of irritable bowel syndrome as well as traditional dietary advice (Bohn et al, 2015). This traditional or first line dietary advice was based on the NICE IBS Management Guidelines mentioned later in the article. In this RCT of 67 people with IBS 50% achieved significant reduction in their symptoms by following a low FODMAP diet vs 46% of those following ‘first line dietary advice’. This is not the only study to show how effective ‘first line dietary advice’ can be for those with IBS. Another study of 82 patients with IBS found that 76% of patients responded with significant symptom reduction after following a low FODMAP diet vs 54% following ‘first line dietary advice’. Did this person need to follow a low FODMAP diet in the first place? As I mention above (and outline below) there are many things you can do before considering a low FODMAP diet. If you see a dietitian they will help determine if any of these other approaches are of value or if the best treatment approach is in fact the low FODMAP diet. Remember most studies find the low FODMAP diet effective in almost 3 out of 4 people with 50% to 80% of people experiencing significant symptom reduction. Clearly this means 20% to 50% find the low FODMAP diet ineffective at reducing symptoms and therefore it might not be the best treatment option for you. At the moment there are no true predictors of who a low FODMAP diet will be most effective in but typically those patients who main symptoms are bloating/distension, flatulence, pain and have loose stools and open their bowels frequently are most likely to find the diet effective. Is it really a good idea to attempt a low FODMAP diet without professional help, considering the lack of evidence for this approach and the potential nutritional and health risks that are associated with restricted diets? The low FODMAP diet has been researched using dietitians delivering the treatment (and completing the research studies) and it is not currently known if a ‘google’ search of FODMAPs or a sheet of paper explaining the low FODMAP diet is as effective as a dietetic treatment. Then there are also nutritional risks from restricting foods you normally consume as you must ensure you replace the missing nutrients appropriately, which a dietitian can advise on. In the UK guidance on IBS by the National Institute of Health and Care Excellence (formally National Institute of Clinical Excellence) (NICE, 2017) actually advises GP’s to make a referral to a dietitian for support with restricted diets specifically for IBS i.e. the low FODMAP diet. I am going to focus on point 3 because I don’t believe enough people with IBS are actually aware of the NICE (2017) guidance in place to help with the management of IBS. Considering that many people attempt the low FODMAP diet without dietetic help you would hope that those who actively seek help from their GP would get a referral to a dietitian. Exert from NICE IBS Guidelines available here. Drink at least eight cups of fluid per day, especially water or other non-caffeinated drinks, for example herbal teas. Restrict tea and coffee to three cups per day. It may be helpful to limit intake of high-fibre food (such as wholemeal or high-fibre flour and breads, cereals high in bran, and whole grains such as brown rice). Reduce intake of ‘resistant starch’ (starch that resists digestion in the small intestine and reaches the colon intact), which is often found in processed or re-cooked foods. Limit fresh fruit to three portions per day (a portion should be approximately 80g). People with diarrhoea should avoid sorbitol, an artificial sweetener found in sugar-free sweets (including chewing gum) and drinks, and in some diabetic and slimming products. People with wind and bloating may find it helpful to eat oats (such as oat-based breakfast cereal or porridge) and linseeds (up to one tablespoon per day). For some additional advice the British Dietetic Association has produced a Food Fact Sheet on IBS that supports recommendations relating to dietary and lifestyle advice for IBS in the NICE guideline on irritable bowel syndrome in adults. I highly recommend taking a look at the resource, a sample of which is shown below. Healthcare professionals should review the fibre intake of people with IBS, adjusting (usually reducing) it while monitoring the effect on symptoms. People with IBS should be discouraged from eating insoluble fibre (for example, bran). If an increase in dietary fibre is advised, it should be soluble fibre such as ispaghula powder or foods high in soluble fibre (for example, oats). If diet continues to be considered a major factor in a person’s symptoms and they are following general lifestyle/dietary advice, they should be referred to a dietitian for advice and treatment, including single food avoidance and exclusion diets. Such advice should only be given by a dietitian. only be given by a healthcare professional with expertise in dietary management. The NICE guidelines thankfully advocate dietetic advice for food avoidance and restricted diets such as the low FODMAP diet. Hopefully many people will get access to a dietitian to help them with this treatment. In the UK if your GP has told you to attempt a low FODMAP diet to self-manage your IBS diet but has not referred you to a dietitian then that GP is not following national guidelines (NICE, 2017). If you find this is the case for you then please do remind your GP of the NICE 2017 IBS Management Guidelines and get that referral to a dietitian which you are entitled to and what is recommended in best practice guidelines. Unfortunately this does not always mean you will get a referral to a dietitian….. Certainly at present it seems the main limiting factor for success of a low FODMAP diet is access to a trained and experienced FODMAP dietitian. It will be very interesting to see more research on the low FODMAP diet that utilises other treatment approaches such as web based applications or other professionals administering low FODMAP advice. Personally I think these non-dietetic based methods will still be effective but will not be as effective as a trained and experienced FODMAP dietitian. If you are struggling to access a dietitian an alternative resource I recommend is the charity The IBS Network. I agree with the approach of the IBS Network which encourages people to seek medical help but also self-treat their IBS and provides them with the resources enabling them to do this. See here for information. Thanks to technology there are also options to see a private dietitian via Skype or consultation platforms at less cost than traditional face to face appointments. Have a read of our Consultations page for the options we provide or search the internet for an appropriate professional to support you. You need to make sure the investigations below have all returned negative! Ensuring the investigations listed below have been completed are recommended worldwide in the management of IBS and in the UK are included in the NICE 2017 IBS Management Guidelines. Read our information sheet on what to do “Before the low FODMAP diet” for clarification. 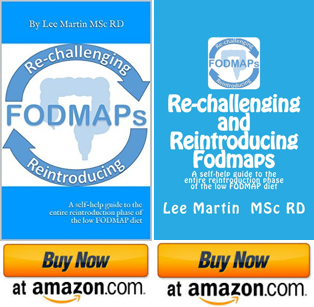 Want more information on the low FODMAP diet and IBS? Click here or for low FODMAP recipes click here. I’m a community dietitian and see this week in, week out! Many patients wanting to go straight for Low FODMAP without any firstline advice. Saw a patient today who was so pleased a few small changes had significantly improved her symptoms! Happy patient = Happy dietitian! Enjoy your travels ladies! Love your stuff! Thanks for that Leigh it’s so nice to get feedback, we are loving travelling! Yes the low FODMAP diet has taken over IBS treatment and you see on the internet it being touted as a ‘cure’ for IBS. Confusing for patients especially as, like you say, sometimes a few small changes can make a big difference.